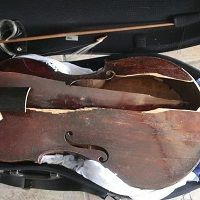 Traveling from Rio de Janeiro to Tel Aviv via Rome, Myrna Herzog was told that there was no room in the cabin for her 17th-century instrument and she’d have to gate-check it. (The airline says Herzog declined the chance to purchase a seat for the gamba; she denies this.) She went public with photos of the damage, and the story has hit major newspapers in Europe as well as The Daily Mail and Fox News.